An erect bushy shrub with stout branches. Long oblong light green leaves smoother the branches and give this dense shrub a very attractive appearance. 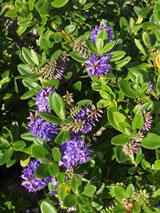 The violet blue flowers are dense and smother the bush and appear in summer and autumn. 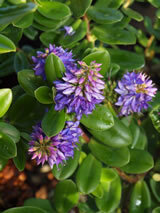 It will grow in sun or semi-shade, best in well drained soil, will grow in dry sites. Hardy to exposed and coastal sites, will always look best in these conditions. Prone to becoming untidy in good garden conditions.